A wet a dreary morning, I made my way through traffic to get to Three Bags Full. I counted the other night, and I am on number 49. My mini milestone of 50 will be planned for this Thursday. As a norm, I have not mentioned coffee machines and or coffee brand. However, it seems that a lot of good coffee places uses Synesso machines, and Three Bags Full is another. They also use the Five Senses coffee. I have had some good experiences with them in the past too. It sounded like that this could be another good hidden coffee place. It is a little off the beaten track. Although I have never really been exposed to Abbotsford. Having a couple of different brewing methods again, it was another place that offered a different coffee experience than the regular. I do like the latte. I’m not sure why though. 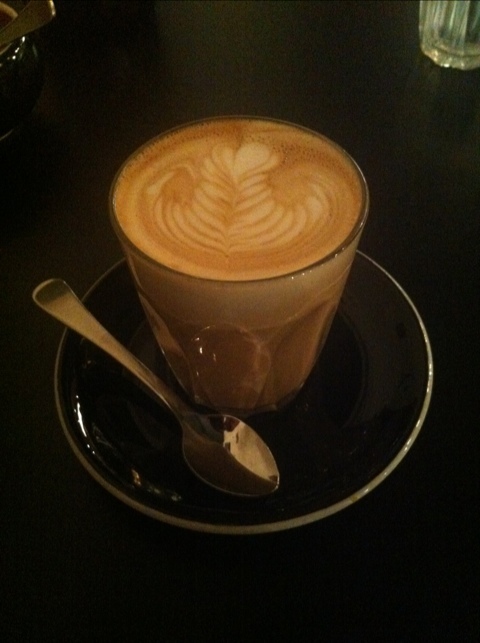 Is it the fact that not being introduced to good coffee has swayed my preference to the latte ? If 5 years ago, I went somewhere for a “coffee”, the beans they used would have been generic. Therefore a shot for example for have tasted ordinary. Did that give rise to my latte habit ? Am I a coffee junkie without taste ? Got my poached with mushrooms. I know. Not the Arn standard. Very simply done mushrooms. Not too extravagant, but good. Poached. Again. Simple but good. The thing I like about simple dishes is that more often than not, the are consistent. I like consistency. Whether it’s bad or it’s good, at least you know what your going to get. The temperature was a little lower then normal. I’m not sure whether it was intentional. However, it made the coffee drinkable immediately. It had a strong aroma, with a darker color. It had a tint of bitterness, that always isn’t so bad, a nice level of acidity. I found though that my last gulp was the best. It really had the taste and body that I liked. Definitely an enjoyable coffee. Ed. I think you’ll like this one. I did invite you. But I will go again.